Guitars are a great instrument for kids, not only are they relatively inexpensive, they are extremely versatile and can be used to play almost any type of music. Learning to play an instrument can help kids improve brain function, relieve stress and learn to communicate their emotions through music. Best of all, knowing how to play the guitar is incredibly fun. Before your kid learns how to play you need to get them the right instrument. This might sound simple, but there are a number of things to consider when you are looking for a guitar for a child. Is my child ready for a real instrument? There are a lot of ‘guitars’ available at big department stores or toys stores that are marketed to kids as a good option for novices. These are generally best avoided if you are looking for a good instrument for a child who is showing a real interest in music. When learning to play, it is especially important to get an instrument that is good quality and easy to play. If you get a terrible guitar that doesn’t play well or sound good, your kids won’t stick with it, and it will leave them frustrated and discouraged. You want to get something that your child will want to use and is comfortable playing. You might end up paying a little bit more up front, but it will help the learning process if they have a good quality instrument to play from the beginning. 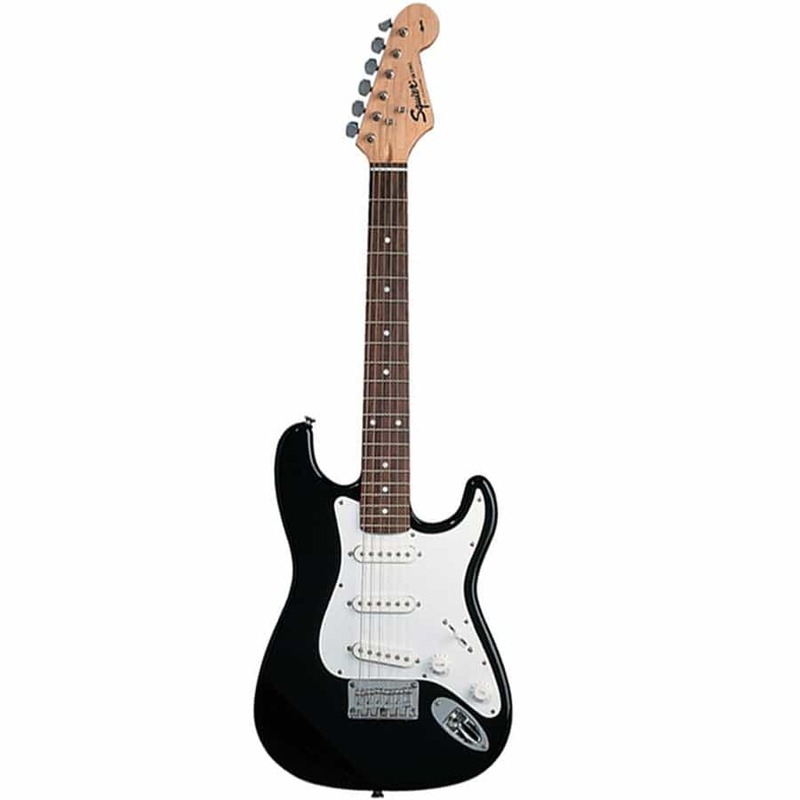 It is very easy to get a real guitar for not much more than you pay for a toy at a big box store. What is a good age to buy a child their first guitar? The best age to start kids depends on the child; some children begin to play as young as age 6, but it is more common for kids to start to take it seriously around age 12. There are both acoustic and electric guitars made for very young kids, so age doesn’t need to be a limiting factor when learning. What parents should focus on rather than age, is trying to determine if your child is ready and wants to learn. Have they been asking to learn? Are they physically able to hold it without dropping it? Are their fingers strong enough to press down on the strings? Will they practice? Are they able to concentrate? If so, then yes, they are ready regardless of their age. If they are eager to learn, then let them at it. Should I buy an Acoustic, Electric or Classical? There are three main categories of guitars: Electric, Acoustic and Classical. An electric has a built-in pickup that converts the vibrations of the strings that are being played into electrical signals that will be amplified. Electrics have steel strings, and if you choose this type you will also need to get an amp and a cable, so the sound can be amplified. 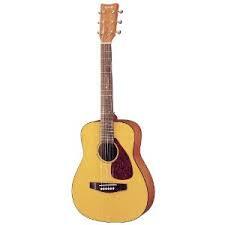 An acoustic generally has a large body and has steel strings. They are sometimes called flat-tops. 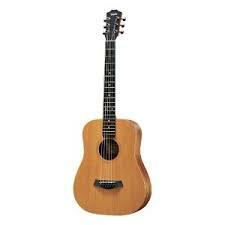 A classical is an acoustic guitar, but it has a slightly smaller body with nylon strings. They also have a wider fingerboard and shorter necks. They are sometimes referred to as Spanish style. The most popular style for children is a classical. The popularity of the classical style for kids is because the price, the size and the string type. 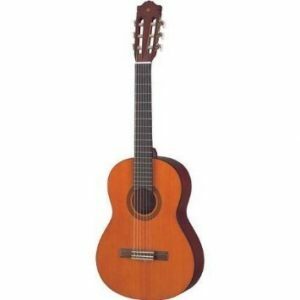 Classical are generally cheaper than other guitars, while the small size is more comfortable for kids to play and the nylon string are easier on kids fingers than the steel string on acoustic and electric. Full sized Acoustic (with steel strings) are not usually a great idea for kids who are just starting out. The thick steel strings and larger necks make them difficult for children’s small hands. Electrics have lighter strings than an acoustic, as well as slimmer necks and bodies, so they are also a good choice if your child has expressed an interest. Electric guitars are generally a bit more expensive because you have the added cost of buying an amp and a cord, but they can be more fun to play and are much more exciting than the nylon acoustic. For beginning children the best options are either classical (a nylon acoustic) or an electric. 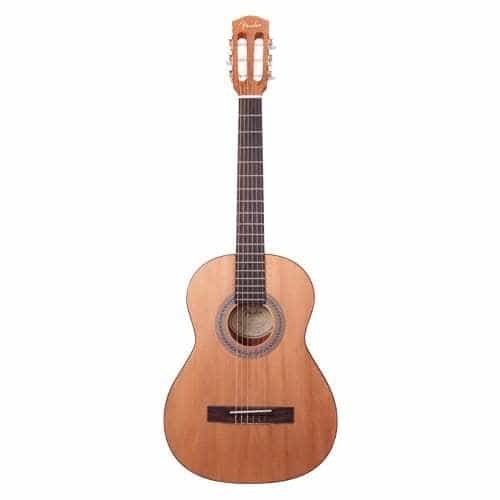 If you are buying as a gift and are unsure whether to get nylon acoustic or an electric, the best thing to do is to check with the child you are buying for. If they have they expressed an interest in one type over the other then that is the guitar you should get. Regardless of what people tell you is the easier one to learn. There is nothing more disappointing than getting an acoustic when you wanted electric and vice versa. If you are buying for a child who hasn’t expressed any particular preference of a type, figure out what type of music they are into and should give you a decent idea about the type music they will be most interested in learning. Is it easier to learn on an Acoustic or Electric? Whether it’s better to learn on an acoustic or electric is up for debate. There is no clear rule which is easier, although there are a lot of different opinions on why one is better to learn on than the other. If someone is telling you that you should start on an acoustic even though your child wants an electric, don’t listen to them. Listen to what your kid wants to do. If they are excited and motivated to learn on a certain type of guitar, then get that type. Having said that, music teachers often recommend starting on a classical guitar. They do this partly because it is the cheapest option and the least intimidating for parents. Also the idea of starting on a classical nylon instrument is based on the type of models that were available 20 years ago, when the best option was a classical nylon instrument. These days’ manufacturers are producing lots of great beginner guitars of all shapes and sizes that are fantastic quality at decent prices. So the idea of always starting on a classical is a bit out of date. Personally, I would start a child on an electric partly because lighter tension on the strings and the slimmer necks make it really easy for kid’s small hands to press down on the strings and actually play. Electrics are so much more fun to play than a classical, and the fun factor alone should help keep kids motivated and interested in sticking with it. A quick note for parents whose children are asking for an electric and you are worried about the volume levels of the amp and how noisy things are going to get around your house. Oddly enough, an electric can be a quieter option than an acoustic or classical because electrics have a volume control and most amps have headphone jacks so your kids can plug in their headphones. So they will be able to hear what they are playing, while no one else has to. This is something that you cannot do with an acoustic because there are no volume control knobs, and it is difficult to control how loud you are playing, especially for a beginner. If you are buying a guitar for a child under age 12 sizing is extremely important. If you buy something that is too large your child will have a much more difficult time learning to play it. There are 4 basic sizes (with a few variations), ¼ size, ½ size, ¾ size and 4/4 (full) size. These recommendations are only a rough guide. When you are selecting the size it is important to go to a music store and try out a few different models. Since there are a lot of different heights within a particular age range, you will want to make sure that your child will be able to wrap his or her left hand around the neck and the right arm and shoulder should fit around the body without any discomfort. A ukulele is definitely a great option to consider for younger kids. You can get a professional quality instrument for a relatively cheap price. A ukulele is smaller and lighter than a full sized guitar making it easier for small kids (usually ages around ages 5-8) to hold and to play. It has four strings (as opposed to a guitar that has six), and it is comfortable for kids to fret because the strings are nylon. It is generally considered easier to learn to play a ukulele and your kids shouldn’t have much trouble learning a simple song within a few days or weeks. There are lots of great videos on YouTube will help kids learn songs and chords. Ukuleles can come in beautiful bright colors that are visually appealing to kids and they are a lot of fun to play. So if you aren’t quite sure if you child is ready for a guitar but you want to get them started on an instrument a ukulele is a great alternative. A note if you aren’t totally sold on a Ukulele: Yamaha has a neat cross between a ukulele and a guitar called GL1 Guitalele Guitar Ukulele that is fantastic instrument and worth a look. What if the child I’m buying for is left-handed? If you are buying for a child who is left-handed you should look for a model that is designed especially for left-handed players. This unfortunately limits your choices a bit, (especially with electric) but there are still some great options. For the most part you aren’t going to be looking for a children’s beginner guitar. What you should do instead is if you are looking for a child who is aged 5 to 8 years old search for ‘1/2 size left-handed guitars’, either acoustic or electric. For kids ages 8 to 12 you should search for ‘¾ size left-handed guitar’. For kids over age 12 you will have much more choice because you can look for regular sized left-handed models, so that opens up your options quite a bit. Check out our post on left-handed guitars. I’m looking for a guitar for my daughter do I need to get one designed for girls? No, of course not. Girls can play any of the models that we recommend. However there are some really nice looking and well-designed guitars that are very appealing to younger girls from companies like Daisy Rock, and Luna. Some of the bigger companies include pink sparkly models like the Darling Diva’s line by Crestwood, or the Fender Hello Kitty Stratocaster (if you can find one ) that some females or males may prefer. The guitars from these companies tend to be a bit smaller, lighter and have thinner necks than standard sizes. If you would like to learn a bit more about some of the models to look out for check out our article on Guitars for Girls. There are a number of things that you need to think about when buying that perfect instrument for your little one. Cost, appearance, playability, brand, size, and what accessories are needed are all things that you should keep in mind when you are selecting a perfect beginner guitar. How much does a starter guitar cost? The cost can vary quite a bit depending on brand, the model, type of wood, and what features it has. A lot of people recommend spending between $100 and $150 on a serious starter guitar, but if that is more than you would like to spend not to worry because there are a few good options for under $100. An Electric will cost you a little more than an acoustic because you will need to buy an amp. If you buy an electric starter package (guitar, amp, cable etc.) you can get a good quality one for around a $100 while you can get a good quality acoustic starting at $50. But like most things you get what you pay for, so realistically if you are looking for a serious brand name beginner guitar for a child then you can expect to pay somewhere in the $100 to $150 range. Should I get a starter pack? A starter pack just means that some of the extras that you will need as a guitar player are included. For example if you buy a starter pack for an acoustic, you will likely get: the guitar, a strap, a gig bag and possibly some picks. If you buy a starter pack for an electric you will probably get: the guitar, a cord, an amp, strings, picks, strap, gig bag, and maybe an instructional DVD. A starter pack is generally a pretty good idea for your first purchase. You might end up saving money and you should get everything you need in one convenient package. Some people argue that starter packs tend to include lower quality guitars and amps, but if you stay away from toy store brands and stick with the bigger brands you will be fine. There are a zillion different guitar companies around, so if you are shopping for a beginner and are looking for high quality instrument it would be best to look at models from some of the top brands. Fender and Gibson are the two biggest electric guitar makers, and if you buy anything from either of these companies or their budget brands Squier or Epiphone, you will be getting a high quality instrument. 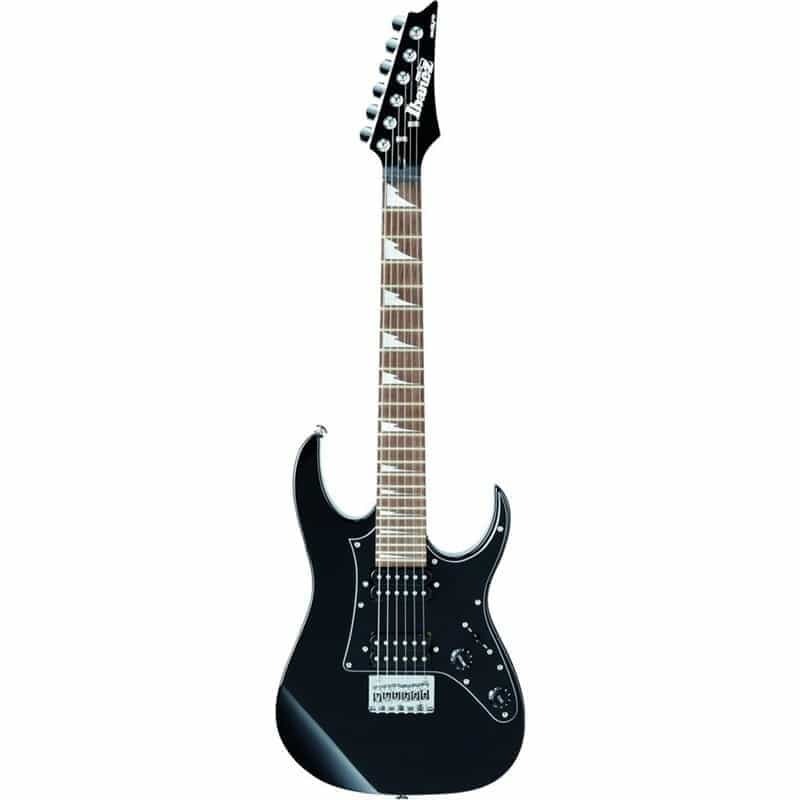 Another great brand to have a look at is Ibanez. If you aren’t sure if your child will stick with it, you can look for guitars from J. Reynolds or Excel, these companies produce inexpensive, beginner guitars. If you are shopping for a high end acoustic, you can look for brands like Martin or Taylor. Yamaha have a good selection of student guitars as well as high end. If you want a more budget conscious beginner acoustic or nylon guitar try Hohner, or Lauren. Your best bet in deciding what to get is, again, to take your child to the store and let them try out a few different models. Another fairly important point to consider when choosing a what will work best is the shape. Different models come in different shapes, and everyone has a preference. The easiest way to find a shape that works best for your child is to head over to a music store and try out a few different makes and models to see what they like and what fits them best. You might be surprised by what they are drawn to. Most acoustic guitars are what are called Dreadnought style. Other styles include Classical, Concert, Grand Concert, Auditorium, and Jumbo. These different shapes have different sizes and depths which will affect how the sound as well as how comfortable it is to play is for a particular player. There are a few different shapes for Electric guitars. I’m just going to mention the most popular to try to avoid any confusion. Probably the most popular shapes are the Stratocaster and the Telecaster made by Fender, followed by the Les Paul and the SG made by Gibson. For a beginner you will probably want stick with one of these shapes to be safe. Electric guitar shapes are a little confusing since Fender and Gibson own the names ‘Stratocaster’ and ‘Telecaster’ while Gibson own the names ‘Les Paul’ and ‘SG’, but you can buy clones of these popular body shapes that are pretty much the same, the headstock is what is different on the clones. Realistically most kids aren’t going to care much about sound and whether it fits them properly, what they are going to care about it how it looks. When choosing a guitar don’t underestimate how important the aesthetic appeal of the colour and design is for kids. Luckily there are lot of different bright colors available for most guitars that kids will love. Another item that kids need is lots of picks. Picks have a habit of disappearing so it is handy to purchase lots in advance. If you are getting your child an electric guitar, you will also need an amplifier and a guitar cable. A good starter amp is a simple 10-watt amp. A guitar bag, guitar strap, and guitar tuner are also good accessories to buy although not necessary. Check out our post on what accessories to get. There is always a risk of the guitar being damaged when it is shipped, so if you are thinking of buying a guitar online make sure you buy from a reputable website. Also make sure whatever site you buy it from offers a 100% money back guarantee in case there is any damage to the guitar when it is shipped.